I hadn’t seen South Park in many years, but coincidentally happened to be watching last Wednesday when Episode 200 was shown. I realised that the portrayal of Mohammad dressed in a bear costume (although it turns out not to be him – see here) was going to re-ignite questions of religious defamation and freedom of expression, and wasn’t surprised to see the Guardian, for example, run with the story for the past three days. Liam Thornton’s interesting analysis on this blog has firmly supported freedom of expression and underlines South Park’s irreverent approach as an ‘equal opportunities offender’. As a human rights academic and a firm believer in freedom of expression, and indeed cartoons as an art form, I am always surprised to find myself often arguing against the cartoonists who are behind the series of recent controversies. I sometimes wonder whether it may be related to the fact that every time I read an article about the Danish cartoons or other such incidents, I detect a certain triumph in the portrayal of Muslims as intolerant of freedom of expression. They’re only cartoons! seems to be the central message. *Spoiler Alert: This post contains some spoilers to the South Park episodes “200” and “201”. In Ireland and the United Kingdom South Park airs on Comedy Central. Comedy Central has not aired the episode “201” in Ireland or the United Kingdom. The episode “201” has been uploaded (illegally) onto a variety of sites. HRiI has discussed extensively the issue of criminal blasphemy in Ireland, over the last few months, see, here, here, here, here, here and here. Contributors to these posts noted Ireland’s hypocrisy on the issue, and the threats which this legislation posed to freedom of expression. 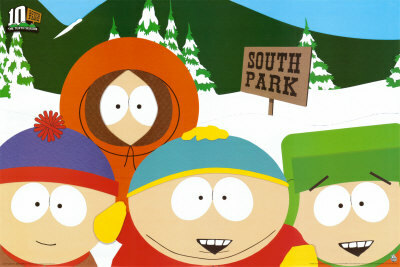 The popular Comedy Central show South Park celebrated its 200th episode recently. In typical South Park fashion it dealt with a number of pressing (and not so pressing) issues. A central focus of both the 200th and 201st episodes (as it was in the episodes Cartoon Wars: Part I and Cartoon Wars: Part II) revolved around the religious prophet Muhammad and the controversy regarding depicting him in human form. A number of groups who did not want to be ridiculed (celebrities and persons with red hair), sought Muhammad’s ‘goo’ which they believed would make them impervious from public ridicule or criticism. In the South Park Universe, Muhammad is part of the Super Best Friends, a group of religious figures (plus one) who help those in need. The group consists of Jesus Christ, Buddha, Muhammad, Krishna, Joseph Smith, Lao Tzu, Moses and a character called Sea Man. The Super Best Friends were introduced to the South Park Universe in 2001, and as the picture to the side shows, there was no controversy for depicting an image of Muhammad (to the right of Jesus). However, with the publication of the Danish Cartoons and the resulting violence (see here, here, here, and to view the controversial cartoons see here), Comedy Central refused to air the image of Muhammad. It had initially been thought that the 200th episode depicted Muhammad dressed up in an oversize bear outfit, harking park to the Sudanese controversy. 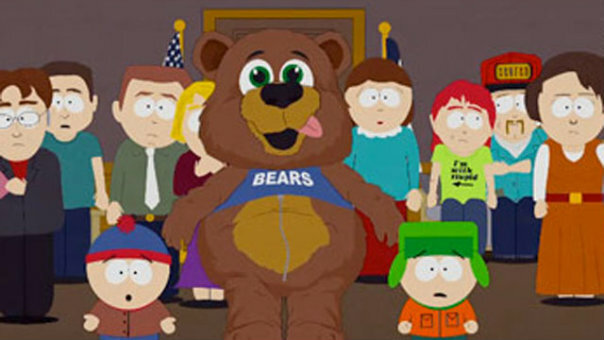 However, in the 201st episode it was revealed that Muhammad was not in the bear costume. For the whole of the 201st episode, images of Muhammad were censored and Muhammad’s name was bleeped from the dialogue. In addition, large portions of the show were bleeped when a number of the characters tried to suggest what could be learned from the problems the characters faced in the episode. The creators of South Park, Trey Parker and Matt Stone, had their addresses published on extremist website forums and suggested they would face a similar fate to Theo van Gogh (see here, here, here, here and here).